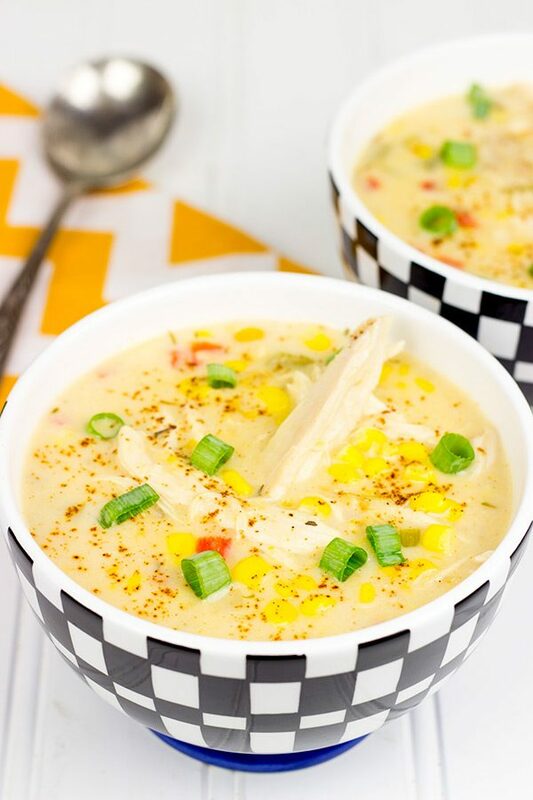 Get the new year started off right with this quick and tasty Healthy Chicken Corn Chowder! For us, early January means eating a bit healthier. I used to just ignore this so-called healthy eating thing. I figured it was a fad that would go the way of “Ice Ice Baby” and jeggings for men. But then I met my wife, and she convinced me to go to the gym in the mornings. She also convinced me to make healthier choices when it came to food. One of my biggest complaints misunderstandings was that healthier foods tasted bland. That’s not the case at all! 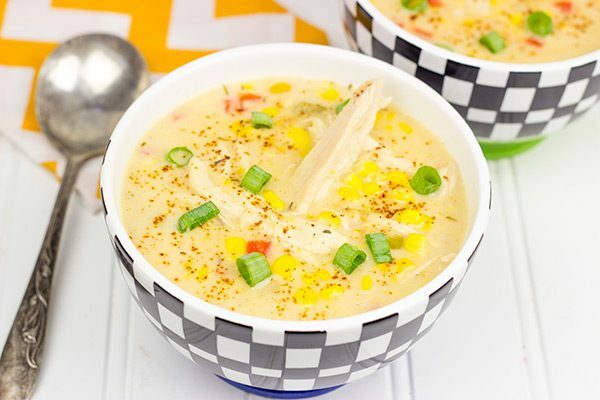 Introducing this Healthy Chicken Corn Chowder. Did you catch that 30-minute part in there? Yup, this chowder only takes 30 minutes to make. The key is using a rotisserie chicken. 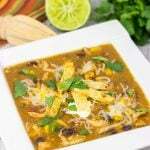 Now like all soups, stews and dips, this Healthy Chicken Corn Chowder will absolutely taste better on Day 2. It tastes great on Day 1, but by Day 2 the flavors have melded into a much tastier dish. So we actually like to whip this up after dinner and then bring it out the next day. 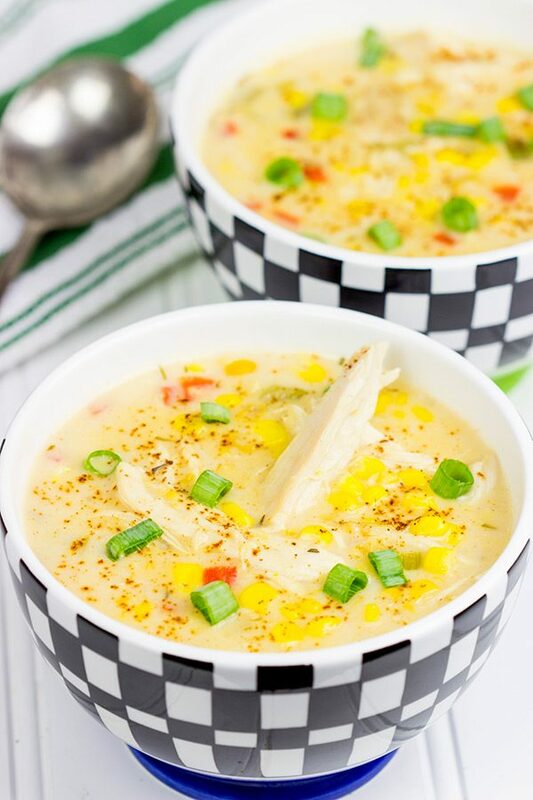 And the best part about this Healthy Chicken Corn Chowder? Well, besides the fact that it’s lighter in calories and only takes 30 minutes to make…you can absolutely adapt it to whatever you have in the house. I included a red pepper and a green jalapeno in this version since I happened to have those in the fridge. Got some dried chilies around? Toss ’em in! Or perhaps some carrots or frozen peas? Toss ’em in! Enjoy! 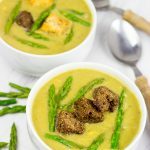 Do you have a go-to healthier soup/stew? Did Santa bring you one too many desserts over the holidays, too? Using a large stockpot or Dutch oven, melt the butter over medium heat. Add onions, celery, garlic, jalapeno and bell pepper; saute for 3-4 minutes, stirring often, until onions begin to soften. Add flour; cook for 1 minute, stirring constantly. Add remaining ingredients (milk, cooked chicken, corn, cream style corn, chipotle powder, thyme and salt). Bring mixture to a boil and cook for 5-7 minutes, stirring occasionally. I love corn chowder. This stuff looks creamy and delish! Thank you so much, Melanie! 🙂 This is our go-to soup every year in early January when we’re tired of eating Christmas cookies. Happy New Year to you, too! That’s so true…most healthy food tastes so blend and blah. That’s probably the main reason why we skip it most of the time. Glad you share this chowder recipe. 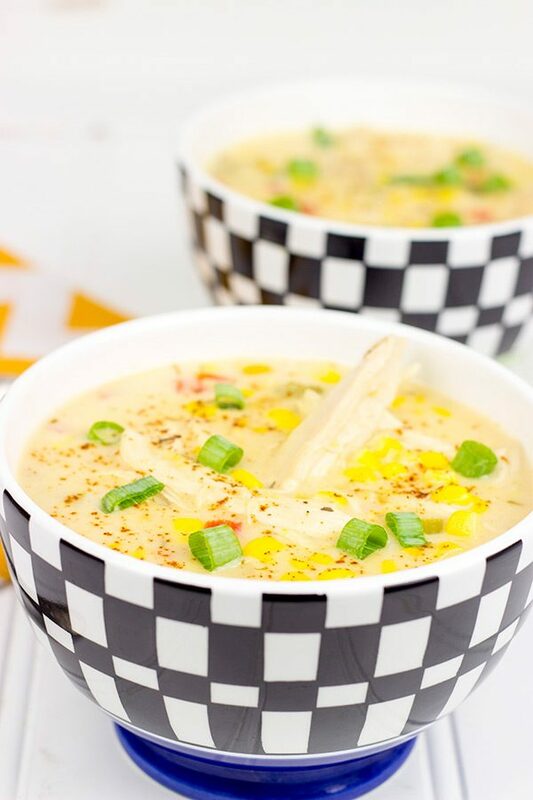 I love creamy corn chowder and this one looks so comforting! Hey now – I am one who subscribes to the whole “healthy-food-can-taste-jolly-good-even-better-than-their unhealthy-counterparts-at-times” mantra and so I gotta give Mrs Spiced two thumbs up for this chowder – even though you doctored her recipe up some for this version 🙂 I love using milk and (GF) flour to make a creamy soup – so much better than heavy cream! Happy Happy New Year – here’s hoping you stay on team Healthy for awhile! Yes, that is true! And you’ve come up with some amazing creations down there, Shashi. If only you lived in upstate New York! You and Mrs. Spiced would be a deadly combination in the kitchen…haha! So I made cookies yesterday (so much for healthy), but I did take them to the curling club instead of keep them around here. Haha! I’m all about the broccoli cheese soup, but I’m backing off that for now and trying to lighten things up a bit. 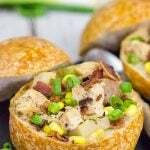 This chicken corn chowder certainly fits the bill! It looks delicious! I can’t wait for the playoffs to cheer on my Panthers! Happy New Year, David! BTW… I had to look up “jeggings” because I never heard of those and am so glad I didn’t – wow, a horrible idea. It’s starting to get chilly and soup is ON my mind 🙂 Delish! This look perfect for the cold weather right now! Thanks so much, Manali! This is one of our go-to soups when we need to “detox” after the holidays. Stay warm out there! Dude. Is this Spicedblog.com or what? Just kidding, this looks delicious and the perfect remedy for all the cookies (or um…waffles and pancakes) santa left or mentally taught me to make for myself. Haha! Hey, it’s healthy eating time now, mate. At least for a bit until the football appetizers roll in. Santa brought way too many cookies, waffles and pancakes this year! I could SO go a big bowl of this right now – it is freezing in iceland. I just love adding sweetcorn to soup to add some creaminess and some crunch too. Wait…Iceland?? Oh, that must be Dave’s surprise birthday trip? Or am I getting everything all mixed up? Either way, thanks, Dannii! (And I can’t help but note the irony of ‘it is freezing in Iceland.’) Haha! I keep thinking about that scene from the Devil Wears Prada where they make fun of Anne Hathaway for getting corn chowder for lunch in a sea of skinny models eating plain lettuce. But see? There’s a way to do it and be healthy. Your wife has it down! This looks great. Hah! Believe it or not, but I’ve actually seen that movie…it was pretty good! I don’t remember that scene, but there is totally a way to make corn chowder healthy. Thanks, Mir…hope your new year is off to an excellent start so far! Wow, a corn chowder that’s actually healthy – what a find! When I think of corn chowder, I think of something full of heavy cream, and it’s so refreshing to see a healthy alternative! It looks just as rich and delicious as the original! Indeed, even though I love adding some butter and cream in soups once in a while, most of the time I keep it simple – just veggies sauteed in a bit of oil/butter + water + some protein/carbs. A piece of cake. Or specifically, a bowl of soup:) I am actually craving for soup so I should consider making one next week. And as about Santa, please don’t pronounce his name. Yes, he brought a lot of sweets (and also made stacks of crepes and pancakes) so I don’t like him for the time being. Haha! Santa brought way too many desserts to our house, too. Why can’t the big man in the red suit show up with soup instead? But yes, this soup is really darned tasty, Ben! It’s one of our go-to meals when we need to cut back a bit. Wow, Jeff…your Cheesy Bacon Butter Chowder sounds delicious! Save me a bowl? Haha…well the healthy eating fad might fade a bit once the Super Bowl apps start to roll in! But either way, this healthy version of chowder is one of our favorite “detox” recipes for right after the New Year. Thanks, Cathleen!